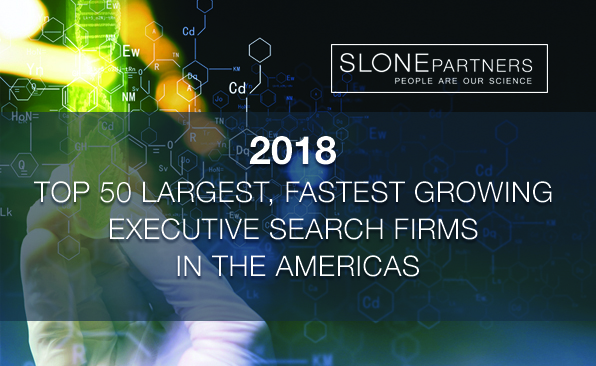 BOSTON, JUNE 2018 – Slone Partners, North America’s leading life sciences and diagnostics industry executive search firm, proudly announces the Company has again been recognized by Hunt Scanlon’s Executive Search Review’s (ESR) Top 50 list of largest, fasting growing executive search firms in the U.S. and Americas. Hunt Scanlon Media, the premier, widely-referenced executive search industry research and news organization, compiled its list regardless of executive search specialty. 2018 marks the firm’s 17th year of consecutive growth as Slone Partners continues to be named to Hunt Scanlon’s compilation alongside esteemed global companies such as Korn Ferry and Heidrick & Struggles. Slone Partners delivers the leaders who build and propel amazing healthcare organizations – People Are Our Science™. Since 2000, Slone Partners specializes in delivering world-class C-suite leadership, executive, and upper management talent to the most promising and established life sciences, research, diagnostics, precision medicine and laboratory services companies. With coast-to-coast presence in the most active healthcare industry hubs of Boston, San Francisco, Los Angeles, San Diego, Austin, Research Triangle Park NC, and Washington DC, Slone Partners uniquely and precisely provides an array of executive search and human capital advisory services to exceptional clients. Our full suite of services includes identifying, negotiating with, and onboarding talent, in addition to post-placement mentoring, success monitoring, and culture fit services. To learn more about Slone Partners unique processes and unmatched network of proven leaders, visit www.slonepartners.com.